Learn Aramaic: How to say 'Holy Spirit' in Aramaic. 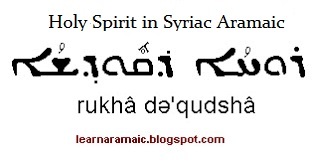 Holy Spirit or Ghost in Syriac Aramaic is Rukha d'qudsha.Rukha is spirit ,d'qudsha is holy. Now let's take a look at how it might be written in the Syriac Estrangelo and then the Aramaic block script (Hebrew).